The childhood immunization program was implemented in Québec to reduce the burden of pneumococcal disease, with the primary objective of lowering the incidence of invasive pneumococcal disease (IPD). The program began in 2002, targeting children with a high risk of IPD, and in 2004 it became a universal program for all children under age five. A schedule of four doses (3+1) is recommended for high-risk children and three (2+1) for other children. The initial 7-valent pneumococcal conjugate vaccine (PCV7) was replaced by the 10-valent vaccine (PCV10) in 2009, and then by the 13-valent vaccine (PCV13) in 2011. Since the program began, immunization coverage rates have been high: over 90% of children receive the recommended number of doses. 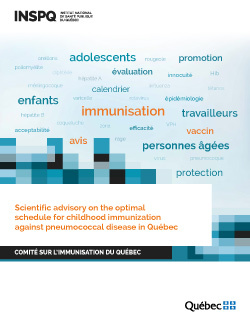 At the request of the Ministère de la Santé et des Services sociaux du Québec (Ministry of Health and Social Services, or MSSS), the Québec Immunization Committee (CIQ) prepared an scientific advisory regarding the choice of an optimal schedule that takes into account dimensions mentioned in the analytical framework proposed by Erickson and collaborators (2005). The data available indicate that the direct protection against IPD caused by the serotypes contained in PCV13 is not much different in schedules that include only PCV10 or PCV13, despite the fact that PCV13 includes three serotypes that are absent from PCV10 (3, 6A and 19A). PCV10 confers cross-protection against serotype 19A and 6A IPD. The efficacy of PCV13 in preventing IPD caused by serotype 3 seems to be low and of short duration, even non-existent in certain studies. A mixed schedule of two doses of PCV10 for the initial immunization and one dose of PCV13 for the booster may provide protection very similar to that obtained with a schedule that includes only PCV13. Despite evidence of the immunogenicity of PCV10 against serotype 19A, and the cross-protection it confers, the advantage of a schedule that includes one PCV13 dose is that it provides reassurance regarding the reduced transmission of this serotype to the entire population, by inducing herd immunity. Based on immunogenicity data, it can be assumed that a mixed schedule would strengthen and prolong protection against serotype 19A IPD, while maintaining the herd immunity acquired with the current schedule. The differences between the various schedules in terms of direct and indirect protection against IPD caused by the 13 serotypes included in PCV13 could be offset by a phenomenon of differential replacement. As demonstrated by the experience in Sweden, this would translate into a higher incidence of non-vaccine serotypes when a schedule including only PCV13 is used, and result in zero effect on IPD incidence caused by all serotypes. Regarding protection against pneumonia and acute otitis media (OM), there is no compelling evidence to confirm the superiority of one schedule or another. There is a possibility that a schedule that includes PCV10 could be slightly more efficient in reducing the burden of otitis and that a schedule that includes PCV13 could be slightly more efficient in reducing the burden of all-cause pneumonia. Both vaccines are safe, although PCV10 is slightly less reactogenic. A potential disadvantage of a schedule that uses PCV13 is an inferior immune response against pneumococcus among infants whose mothers received the diphtheria, tetanus and pertussis vaccine during pregnancy. Assuming that the acquisition cost of the PCV13 vaccine is substancially higher than that of PCV10, an economic evaluation shows that, in most plausible scenarios, a mixed schedule or a schedule including only PVC10 would be more cost-efficient than a schedule that includes only PCV13. On the local level, it is more difficult to manage a mixed schedule that includes both vaccines than a single-vaccine schedule. However, the number of errors could be minimized with the training opportunities usually available. In the event that a mixed schedule is chosen, administering one vaccine instead of the other should, in all likelihood, pose no major risk. Certain healthcare professionals prefer vaccines that contain a maximum of serotypes since this makes it possible to minimize the theoretical risks of an inadequate control of serotype 19A with a program that includes only PCV10. A mixed schedule that includes PCV13 for the booster would provide some reassurance to those who prefer this vaccine. To conclude, the three schedules assessed in this scientific advisory may be justified and none can be unequivocally rejected. The 2+1 PCV10 and 2+1 PCV13 schedules are used in numerous developed countries and a mixed schedule cannot be inferior to the former. The two greatest uncertainties hindering the decision-making process are the number of additional IPD cases that could possibly occur in children using a 2+1 PCV10 or a mixed schedule, versus the current PCV13 schedule, and the price difference between these two vaccines. The cost-efficiency ratios of the different scenarios are adjusted using a combination of these two parameters. If it is considered that there is no or little difference in the number of IPD cases, the 2+1 PCV10 is the most efficient option, assuming the unit price is less than that of the PCV13. In most scenarios, the mixed schedule is an economically enticing option compared with the 2+1 PCV13 schedule. The primary advantage of the mixed schedule would be to maintain the gains attained using the current schedule in terms of reducing the burden of the illness and preventing the risk of a rise in the incidence of serotype 19A in the entire population. The current schedule should be maintained if the cost difference between the two vaccines is low. Should uncertainty remain regarding the price and purchase conditions of the vaccines, it seems sensible to not make a univocal recommendation and to let the Ministère de la Santé et des Services sociaux make a final decision based on its priorities and the proposed prices. If it is not possible to negotiate the purchase of vaccines for a mixed schedule and if the only options are to either maintain the current 2+1 PCV13 schedule or to choose a 2+1 PCV10 schedule, another consultation should take place. Whatever the decision, active and ongoing monitoring of the epidemiology of IPD and hospitalizations must continue. Should any changes occur, the CIQ could revise its scientific advisory and adapt the program accordingly. A supplementary scientific advisory regarding the recommended schedule for high-risk groups including children living in Québec’s northern regions will be written at a later time.